Local filmmakers, film connoisseurs, and any others who feel the gravitational pull towards the stories not often told or the roads less travelled should set their sights on Cinematheque this weekend, host to the sixth annual Gimme Some Truth Documentary Festival. 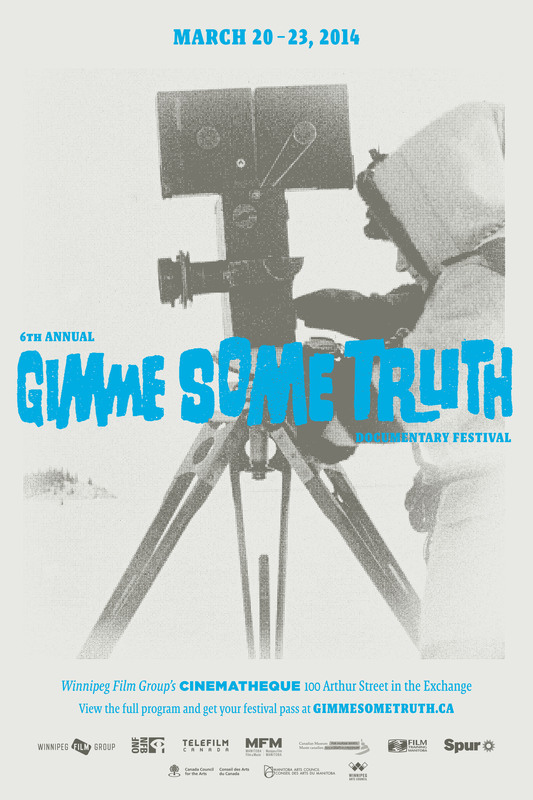 “Gimme Some Truth was created to showcase the world’s most challenging, uncompromising, and poignant documentary, and to invite the most renowned veteran documentary filmmakers to Winnipeg to share that history with our local emerging filmmakers,” says Kier-La Janisse, one of the festival’s organizers. Gimme Some Truth is put on through the Winnipeg Film Group, and is a collective effort between Janisse, Jaimz Asmundson, Dave Barber, and Alex Rogalski. Documentary films often live in a grey area between news and art, and can have a lasting, transformative effect on audiences, igniting passions and changing worldviews. “Growing up watching Joe Berlinger’s Paradise Lost (1996) made me realize the potential power of documentary not only as an art form but as a politically charged document that can create actual changes in our world,” says Asmundson. The festival will also feature panellists and speakers like John Greyson, who is seen by Barber as “one of the bravest independent Canadian filmmakers.” Greyson will be part of a panel on personal and political filmmaking, bringing his recent experience of having spent seven weeks in an Egyptian prison with him, as well as the documentary Rebel in the Night (The Human Rights Shorts of John Greyson). Specifically, two local films will be making their world premieres this weekend. On the Trail of the Far Fur Country by Kevin Nikkel is “an epic piece of research into the 1920 silent film that follows a film crew’s epic journey across Canada’s North,” and will be showing on March 23 at 7 p.m.
A “hilarious and in-depth look at the mark our local music scene left on [the] punk landscape in the late 70s and early 80s,” Kathryn Martin’s Piss on You: Winnipeg’s Early Punk Scene has already sold out of the first screening, and festival organizers have added a second showing at 11 p.m. on March 22. The relative democratization of technology has opened up new possibilities in the field of documentary making, which is an exciting development for those passionate about the form. There is a lot more to documentary making than simply grabbing a camera and capturing footage of events, however, and the art of storytelling and selection is showcased in films selected for Gimme Some Truth. Gimme Some Truth is held from March 20-23 at Cinematheque, 100 Arthur Street. Visit www.gimmesometruth.ca for more information.